A chaise lounge chair can help you relax after a long day at work and they blend well with other furniture in the house. Allowing you to either sit or lie down, chaise lounges can be used for anything from a quick power nap to light work. Though wooden lounge chairs are often used outdoors, they can make excellent additions to any indoor room. Select the wood for your chaise lounge. As these loungers are going to be for indoor use, most woods will suffice. If, however, you want an indoor lounge chair that can be used outside, choose a wood that is strong enough to endure the harsh treatment of the elements, such as oak. Saw nine 1-by-4-inch lumber planks measuring 8 feet long into two boards at 74 1/2 inches in length, five boards at 19 inches, five boards at 51 inches, two boards at 76 inches, four boards at 11 1/2 inches, and five boards at 25 inches. Saw one 1-by-2-inch plank into three boards at 23 1/2 inches, 23 1/2 inches and 18 3/4 inches, respectively. Lastly, cut one 2-by-2-inch plank into three boards at 17 1/2 inches and two boards at 9 1/4 inches. Set aside the 1-by-2-inch leftovers to be used as stops for the reclining back. Assemble the frame by attaching the five 1-by-4-by-19-inch joists between the two 1-by-4-by-74 1/2-inch rails with 2-inch countersunk screws. The first joist should be flush with the edges of the two side rails, the second should be 24 1/4 inches from the outside face of the first joist, the third should be 41 inches from the first joist and the fourth should be 57 inches from the first joist. The final joist should be flush with the opposite edges, about 16 inches from the fourth joist. Ensure that the distance from the outer face of the second joist to the opposite face of the fifth joist is 51 inches and that all of the edges are flush. Lay the five 1-by-4-by-51-inch deck boards across the last four joists, so that three-fourths of an inch overlap the fifth joist and the opposite edges are flush with the outer face of the second joist. Space each deck board one-fourth of an inch apart, leaving one-fourth of an inch on either side so that the total distance, including the outer spaces, equals 19 inches. Use 2-inch countersunk screws to secure them into the joists. Fix the 1-by-4-by-76-inch boards into place on either side of the decking, using the same screws and ensuring that there is three-fourths of an inch extending past the joists on both ends, and that the outer edges are flush with those of the decking you just installed. Install the four 1-by-4-by-11 1/2-inch legs, using the same 2-inch countersunk screws. They should be flush with the edges of the 76-inch long boards, allowing screws to be placed into the joists as well as into the outer deck boards. Use strong wood glue on one face of each 1-by-2-by-23 1/2-inch board and secure them to the inner part of the hole between the first and second joists, flush with the bottom of the frame. Clamp them into place to allow the glue to set, and add final security by nailing them into the side rails of the frame using 1 1/4-inch nails. Line up the five 1-by-4-by-25-inch boards next to one another, leaving one-fourth of an inch of space between each one. Ensuring that the total width, from edge to edge, is 18 1/2 inches, glue one of the 2-by-2-by-17 1/2-inch boards flush with the bottom, leaving half an inch on either side. Glue the second board in place so that the distance between the two inner faces of the first and second boards is equal to 12 inches, and glue the third in place 3 1/4 inches from the top. Turn the assembled backrest over and fix each board into each deck board using 2-inch countersunk screws. Lay the backrest flat against the lounge decking, so that the bottom board is flush with the hole between the first and second joists. Using half-inch screws, attach 3-inch hinges on the two outer deck boards of the backrest and the deck boards they align with on the lounge. Before proceeding, pull the backrest down, ensuring that the hinges function properly and that the backrest can lie flat, flush with the top of the lounge decking. Construct the backrest support prop by screwing the two 2-by-2-by-9 1/4-inch boards into the 1-by-2-by-18 3/4-inch board, leaving roughly three-fourths of an inch on either side. Secure the support into the second 2-by-2-by-17 1/2-inch backrest board using 1 1/2-inch hinges secured with 1/2-inch screws. Rotate the support prop for the backrest up and down to ensure that the hinges function properly, while leaving the backrest facing downward. Attach six of the remaining 1-by-2-inch leftovers onto the cleat inside the hole using wood glue and 1 1/4-inch nails. Their placement is unimportant, as long as you leave room for the backrest support to fit between them, as well as enough room for the backrest to close into the flat position. 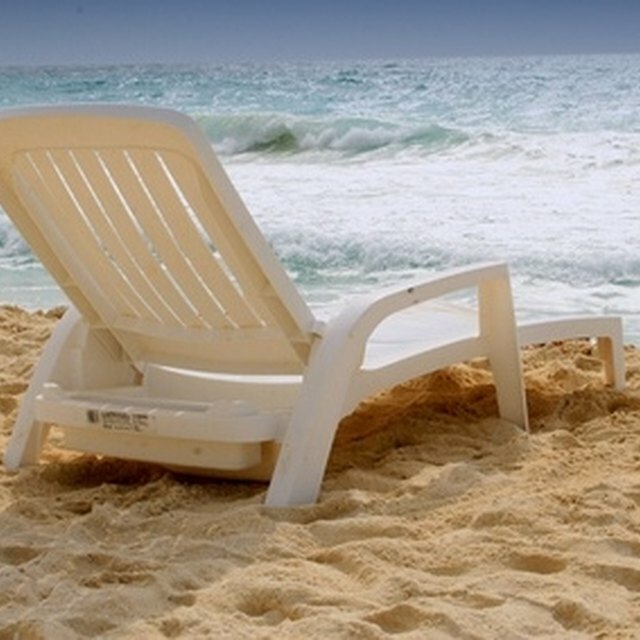 Look over the lounge chair and sand any uneven edges to avoid cuts or splinters. As this lounge uses a simple wood design instead of the traditional French design, it can work well both indoors and out. For primarily indoor use, the lounge can blend beautifully if you paint or stain the wood to match the furniture you already have in the room where the lounge chair will go. Sarah Jones has been writing professionally since 2004, contributing to several online publications. She runs her own business as a landscape horticulturist and has more than 25 years of experience in the plant-care field.